Summer always reminds me of my childhood more than any other time of year. I think this is because for nearly 10 years after my parents divorced I would go back to my home state to spend the three months of summer. Which was great for a variety of reasons, but primarily because nothing beats summer in New England. Its the quintessential summer filled with watermelon, ice cream and backyard picnics. At this moment, it is safe to say I have four different kinds on ice cream in the freezer. Cookie dough, fudge brownie, caramel cone and lastly good ole strawberry. We also have leftover Carvel Ice Cream cake. The strawberry is the newest addition to our little ice cream collection. 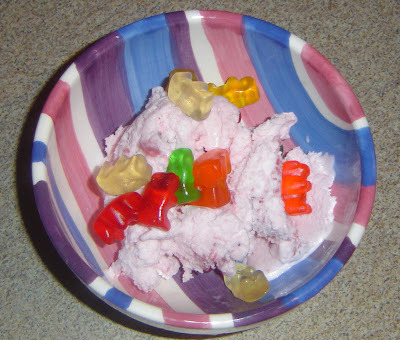 The other night BD mentioned something about gummy bears and all of a sudden I had this craving: Gummy Bears on Strawberry Ice Cream. I probably hadn't it since I was a teenager and boy was it good. If you've never tried gummy bears as a topping for ice cream, I strongly suggest you do. Best bet is to go with a fruity ice cream...chocolate doesn't take well to gummy bears.